It’s the season of the roast. But who can be doing with all that slaving over a hot stove? Not to mention the washing up. The smart move is to venture out and make someone else do the work for you! 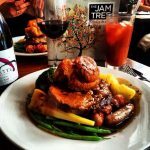 We checked out The Jam Tree, a stylish gastropub on London’s fashionable King’s Road in Chelsea. For me, every Sunday lunch should begin with a Bloody Mary. And at the Jam Tree you are spoilt for choice with a dedicated ‘Bloody Mary Menu’. We opted for the show-stopping ‘Maple Bacon Bloody Mary’ which – yes – comes with a piece of freshly grilled, thick-cut bacon. A further smoky hit is provided by bacon-infused Jim Beam Maple Bourbon. Lovers of a spicier Mary should opt for the ‘Smoking Hot Mary’, an extra strong version made with Chase Smoked Vodka. Before the main event we tucked into a dish of Sotong Manis: super-crispy battered squid in a sweet Kecap Manis (Indonesian sweet soy sauce). Lime juice and a kick of fresh chilli cut though the sweetness – and boy, that Bloody Mary was the perfect accompaniment! For something lighter try the heirloom tomato and Buratta starter. The sliced multi-coloured tomatoes are dotted with Italian soft cheese and rocket, and doused in a deliciously lemony shallot dressing. Onto the roast itself. The idea here is sharing with all the sides served ‘family style’ on sharing plates. Your plate arrives with your meat of choice ready for you to load up. We opted for the beef sirloin which didn’t disappoint. The fantastic Yorkshire puddings are worth a special mention, as are the deliciously crispy roast potatoes. You also have swede and carrot mash, roast parsnips and spring greens to choose from. The only disappointment was the cauliflower cheese. Perhaps in an effort to avoid a claggy mess it was actually missing much cheese at all. If you have space for dessert the chai spiced rice pudding is worth a try. It’s more rib-sticking goodness served with mixed poached fruit. And if it’s still blowing a gale outside – or bucketing it down as it was when we visited – why not return to the cocktail menu for an espresso martini? There’s also a reasonably priced wine list (we opted for a bottle of the house Tempranillo at £19). The more adventurous should try the ‘Jam Shots’ – jams and marmalades shaken with vodka. You can even join one of their regular Cocktail Masterclasses to learn how to make said concoctions. So this is apparently one of the places to catch the Made in Chelsea crew off duty. But it ain’t no Archer Street or Bluebird. Branches in both Chelsea and Clapham are decorated in a similar vein. It’s all about tin roof tiles, stripped floorboards and Chesterfield sofas. A mixture of vintage chandeliers and Tom Dixon copper lights create a cosy atmosphere. Quirky touches like the wall made out of cassettes and a retro popcorn machine add character. Gastro-pub clichés include the Cole and Son ‘Woods’ wallpaper, exposed brick and a selection of retro-style advertising mirrors and prints. It’s actually looking a little tired and could do with a fresh lick of paint. But it’s nothing if not lived-in and cosy. Its location amongst the high-end interiors shops of the King’s Road is handy if you need an upmarket rug or two – but also creates some stiff competition in the style stakes. Around £47 per person (based on two cocktails, two starters, two roasts, a bottle of house wine and a dessert to share). 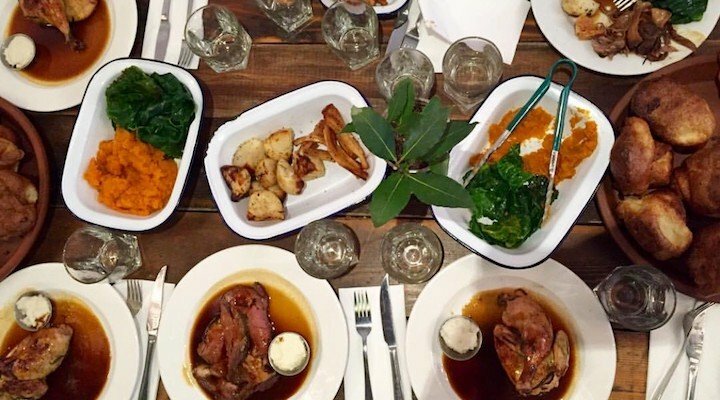 Come for the Sunday roast but stay for the cocktails at this cosy King’s Road local.